Accidents happen at work. They are sometimes unavoidable even if you observe utmost safety precautions. 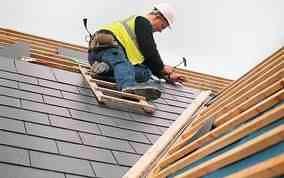 Roofing, in particular, is a hazardous job that exposes individuals to different risks, including falls, cuts, heat stroke and exhaustion. If injuries do occur, call medical assistance immediately and help the victim by applying first aid while waiting for help to arrive. Below are the common injuries sustained from roof repair Houston accidents, and the steps that you can do while medical help is on the way. If the skin breaks and the bone protrudes, immediately stop the bleeding by applying pressure and control the swelling by applying ice packs. Look for any available strong and straight objects nearby and affix to the affected part to keep the limb immobile. Do not touch the bone pushing through the skin or attempt to set it back in place. Clean the wound with water and soap to disinfect it and apply pressure with clean cloth or gauze. If no materials are available that could be used as dressing, thoroughly wash your hands and apply pressure to the wound using your fingers. Do not remove a blood-soaked bandage, simply apply a fresh one on top. For severe bleeding, raise the affected part above the heart level. Make the victim lie down and ensure that breathing is not blocked. Place pillows or soft cloth under the head and shoulders and turn the head to one side. This will prevent accidental chocking while the victim awaits medical attention. This condition is categorized as a medical emergency. Remove the victim from direct sunlight and into the shade. Putting the victim in an air-conditioned room is preferred. Apply ice or cold wet cloth on the armpits and neck area to cool the body. Never give water to a vomiting or non-alert individual. Promptly get the victim out of heat and into a cool or air-conditioned room. Apply the cool compress, give the person a cold shower, spray water to cool the body temperature and give a cool sponge bath. If the victim is alert, give non-alcoholic and non-caffeinated drink to rehydrate. Remove the object that caused the wound, if it is small and could be easily removed. Stop the bleeding by applying pressure with clean cloth or gauze. Clean the wound with water and soap then apply antibiotic cream. Wrap the wound with sterile bandage or cloth to prevent dirt from getting in.